I've decided to start up a Melbourne User Group. 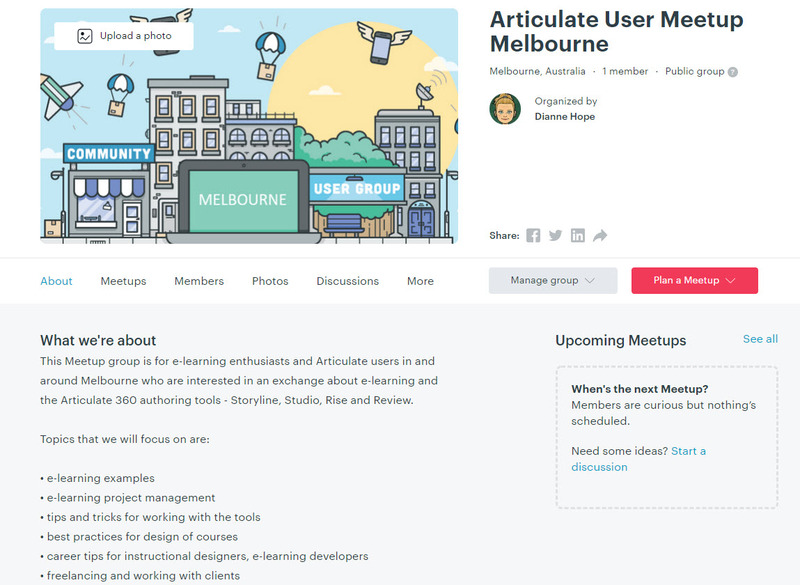 I'm just waiting on approval for the new Articulate User Group Melbourne MeetUp page. If anyone in Melbourne and surrounding areas is interested - please let me know. As soon as I have approval, I'll post more information in this community. Seriously! Maybe?...what if I made this an online meetup Matt? Awesome! Remember you and I first met over 3 years ago at the one and only Articulate User Group in Melbourne...we both presented and I remember there were a lot of people in the room....it's been too long! I like the idea of an in person meet up Dianne, it just depends on timing, babysitting availability, and so on. Being in Ballarat means that a 1h meeting in Melb usually ends it taking me more than half a day with travel time etc. It's a great idea though and I'll do my best to attend. My availability to attend face-to-face functions will also be limited, but i am interested in joining as a member of a (local-ish) professional learning network. That is, I am interested in being kept in the loop as to what's going on, even if I can't always be directly involved. Warrandyte sound fine to me - I hope to be scheduling a meetup some time in February-March.